I've setup a virtual network in Azure with a site-to-site VPN tunnel. So far so good, but the tunneled devices cannot access my servies via the public IP, they can only access via the local IP. Seems something prevents VPN devices to access the public IP of a VM connected to the same virtual network. So say api.mydomain.com is mapped via DNS to the public IP of a VM. That works fine for all internet devices, but not the ones that goes though the site-to-site VPN tunnel. They can access fine via the local ip (192.168.x.x) though. Any way I can open access/route the traffic coming in via the site-to-site VPN to the public IP address? The devices in question are GPRS devices and uses the DNS of the cell operator. So nothing much I can do there (like adding an entry to point to the local address). You can set up entries for your private IP addresses in /etc/hosts file, which will override DNS. 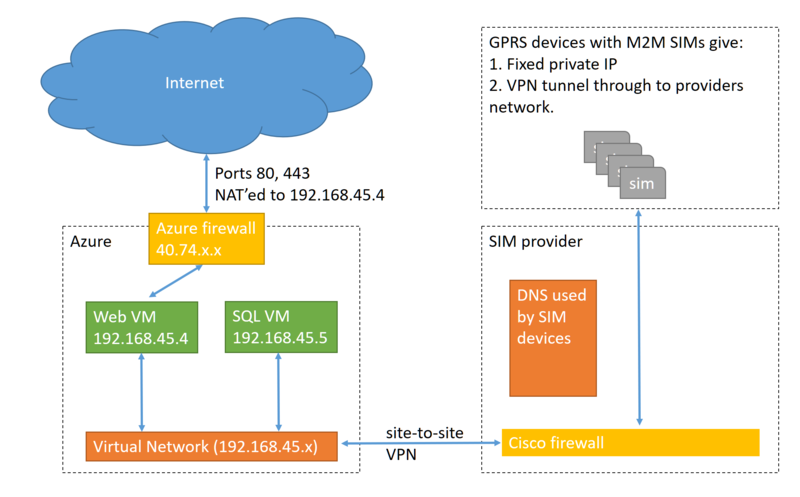 After raising a ticket with Microsoft Azure support, they came back stating the site-to-site VPN in Azure is for connecting two private networks. You cannot route traffic from one side, thought the tunnel and out on the internet at the other side. The Azure routing will not allow that. So to get true end-to-end tunneling I have to implement a split DNS. Not the answer you're looking for? Browse other questions tagged firewall routing azure virtual-network or ask your own question.